Basketball is the perfect sport to get children off the couch and outside being active. It can be played at any age and is suitable for all genders. Basketball doesn’t require any particular skill level to play, all that is needed is a ball and hoop. This fun to play sport has lots of benefits for children and should be a sport that all children engage in from a young age. Here are the benefits of basketball for kids. Basketball is a high-intensity sport that works the whole body. It involves running, jumping, hand-eye coordination skills like dribbling, passing the ball and shooting the ball. As with all high-intensity sports, comes many cardiovascular benefits and basketball is no different. Continuous movement in a basketball game will help increase endurance and aid muscle development. Between sprinting, jogging, jumping, dribbling, and working on skills, kids are doing total body interval training without even realising. This boosts their aerobic fitness, metabolism and energy levels which in turn makes them more cardiovascularly fit as well as helping them concentrate more in school. Playing basketball involves different skills and movements like catching, dribbling, throwing, changing direction and pivoting. Learning basketball and executing these movements at a young age will improve their motor skills by using major muscle groups. Kids who play basketball will improve their fundamental movement skills, flexibility, central nervous system messaging and many more components of fitness. Your child will also significantly improve their hand-eye coordination. These motor skills are applicable to other activities of daily life. Performing drills will allow kids to work on their muscle forces, control the movements and positioning of their bodies and execute movement sequences. Playing basketball allows your child to make new friends and feel a sense of involvement. It improves their ability to communicate and solve basic problems. With playing basketball your child will experience the benefits and difficulties of healthy competition. This prepares kids for failures later in life. Basketball teaches them to work hard and be dedicated to something and you will reach the top level. It shows them coping strategies and teaches them social skills that they can use at home, school and in peer relationships. It is great for a child’s character building and their self-esteem. As they realise their increased skill level and athletic development, they will gain increased levels of self-confidence on the court. Having a child in a supportive team setting with the encouragement from friends and family is invaluable in helping develop a child psychologically and making them feel good. Basketball is just like every other sport, meaning when you play you have a number of rules to follow. If they are not abiding by them, that will lead to penalties. This principle mimics real-life situations. For example, if a teenager breaks the law then they will be given a penalty. So basketball is a good way for your child to appreciate the importance of following rules. This sport is a fantastic way to teach your child a sense of discipline because basketball involves taking direction from officials, coaches and fellow teammates. This helps them realise the importance of listening and respect for others on and off the court. To see our full range of basketball products visit us online today or for more information call us on 021-496-5132. Football rebounders are multifunctional so they can be used for all sorts of sports. They train all sorts of ball skills like passing, reactions, shooting, goalkeeping, kicking, throwing and heading. EXIT rebounders are easy to take along and use at any location meaning you can train whenever and wherever. For people who love playing football and training to become the best football players they can, football rebounders are fantastic pieces of sports equipment. They improve your playing skills, precision and reaction to the ball. For sports clubs, they are a nice variation to use during training. Challenge team members to get the best of themselves or to use them in a creative play or match scenario. EXIT rebounders make each training session unique and benefit all players from goalkeepers to strikers. Here is our fantastic range of EXIT rebounders. The EXIT rebounder is not only fun for the garden but also an essential piece of equipment for training your soccer skills. The angle of the rebounder can be set between 35 ° and 90 ° so the rebounder is suitable for all kinds of training and skill levels. Setting the angle is quickly and easily done. It is beautifully designed and very robust. The metal is galvanized and then powder coated black. So double the protection for years of use. The net of the rebounder has strong rubber bands attaching it to the frame which ensure it gives a silent but very powerful rebound. It is finished with a high-quality PVC cover edge. Two anchors are supplied to secure the Rebounder and ensure its safe. It comes in three different sizes: medium(84x84cm), large(124x124cm), Xtra large(164x164cm). The EXIT Kickback football rebounder 124x90cm Multi-station is the ultimate piece of soccer equipment to hone your skills. You can work on different game elements like passing, kicking, first touch control, shooting, goalkeeping and heading the ball. Kick or throw the ball against the rebounder and it comes back with a surprisingly high speed. This is a great piece of training equipment that will add endless fun to your garden. It has dimensions of 120×90 cm. The kickback multi-station rebounder can be set between 35 ° and 90 ° in 7 positions so it is suitable for all kinds of training and skill levels. Changing the angle of the rebounder is easily and quickly done. This rebounder is beautifully designed and very robust. The metal is galvanized and then powder coated black, giving it double protection for a long lifespan. The net of the rebounder has strong rubber bands attaching it to the frame ensuring a strong, silent but very powerful rebound. It is finished with a high-quality PVC cover edge. Two anchors are supplied to keep it secure and safe. The EXIT Kickback multi-sport omni-trainer is an innovative and unique piece of sports training equipment. It is the perfect way to improve your ball skills in a wide range of sports. It has a sturdy frame which is galvanised and powder-coated for a long lifespan and a beautiful look. This rebounder comes with an anchoring set which consists of ground pins for outdoors and a sandbag for indoors proving extra strength preventing it from moving during use. It has a green side and a black side that can be easily adjusted to various angles. The green side (71 x 112 cm) has a fine-meshed net for a straight bounce, the black side (119 x 130 cm) comes standard with two nets, a fine-meshed net and a coarsely‐woven net so you can alternate your training methods. Manual is included. The EXIT Panna field oval 26ftx16ft will transform any location into a Panna field. You can easily set it up and after it can be quickly stored away using a specially developed fastening system. Instead of screwing the frame parts to one another they slide into each other. Its frame is galvanised and powder-coated and the interior side is covered with black PVC panels for a cool look and a long lifespan. It can be used on any type of surface, both hard and soft meaning it is not just great for home gardens but it is also suitable for football clubs and schools. With a diameter of nearly 8 metres, you learn to improve your football skills and techniques in a challenging way so that during a match you perform to the best of your ability. Included in this sleek black designed piece of football training equipment is 12 frame parts with 2 integrated football goals, anchoring set and a manual. The EXIT Rapido foot-skills-trainer XL is a fantastic piece of training equipment. Using an extension kit, the frame can be expanded up to 521 cm. It is suitable for beginners and adults because the player has a longer time to react as well as more space to operate in. With this piece of sports training equipment, you improve your football skills and techniques in an ultra-fast tempo. Its frame is strong, galvanised and powder-coated ensuring a long lifespan. The hexagonal training system has two different sets of panels: panels with a net rebound the ball quickly and the other ones more slowly. This helps players develop the best football skills that will replicate a real game scenario. Included are 3 black rebound panels that rebound at normal speed, 3 rebound panels with a net that rebounds the ball faster, various rebound panels and a manual. To learn more about our EXIT rebounders then contact us today by calling us on 021-496-5132 or by visiting us online. Basketball is a sport that any boy or girl can start at any age. 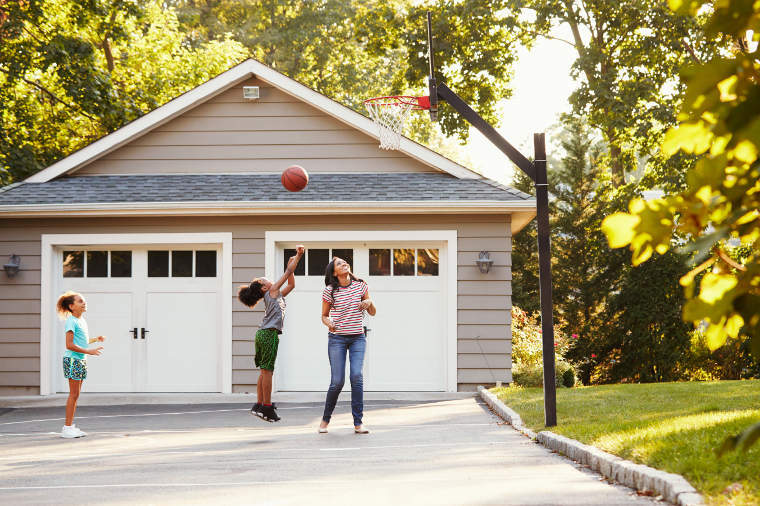 Playing basketball helps kids learn basic coordination, encourages exercise and serves as a foundation for staying active later in their life. EXIT has a wide range of portable basketball backboards, basketball hoops and nets which are of excellent quality, height-adjustable and suitable for every age. We have a great range of basketball toys for child development. 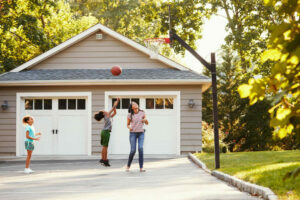 The EXIT size 7 basketball is ideal for at home as well as on a basketball court. This basketball is the official competition size with a diameter of 75 cm. The EXIT size 7 basketball has an anti-slip surface providing optimal grip and ball control. Ball pump needle included (excludes pump). It is black in colour. The EXIT Galaxy basketball backboard with hoop and net is a sturdy backboard made from polycarbonate on a metal frame. It is suitable for all Galaxy basketball systems. This basketball system comes with a hoop and net. Train your basketball skills, make cool slam dunks or defend the hoop with the EXIT galaxy basketball system. Manual is included, it is green/black in colour. The EXIT Galaxy wall-mounted basketball backboard with dunk hoop is green and black in colour and guarantees hours of basketball fun. This backboard has a dunk hoop that encourages great dunking and basketball moves. Practice your shooting and all your basketball moves on this fantastic basketball system. It is simple to mount to a wall and can be adjusted to five different heights (230, 245, 260, 285, 305 cm). It is robust and made from high-quality materials giving a long lifespan. Includes net, manual, mounting materials and wall support with fastening set. The EXIT Galaxy wall-mounted basketball backboard will keep your child entertained for hours. It can be mounted on any wall making it ideal for any place in your home. It can be adjusted to five different heights (230, 245, 260, 285, 305 cm). This black/green basketball system is robust and made from high-quality materials ensuring it will last for a long time. Train your basketball skills with this amazing backboard with a dunk hoop. It has a very sturdy frame and includes mounting materials, wall support with fastening set and a manual. The EXIT Galaxy portable basketball backboard on wheels with dunk hoop will provide your child with hours of basketball fun. This basketball system has a unique frame on 3 wheels and a counterweight, making it sturdy and easy to play basketball at any location. Its springy hoop allows you practice the coolest dunks and basketball moves. Its swivelling castor at the front side lets you steer the backboard in any direction. It can be adjusted to five different heights (230, 245, 260, 285, 305 cm). Includes manual and is green/black in colour. 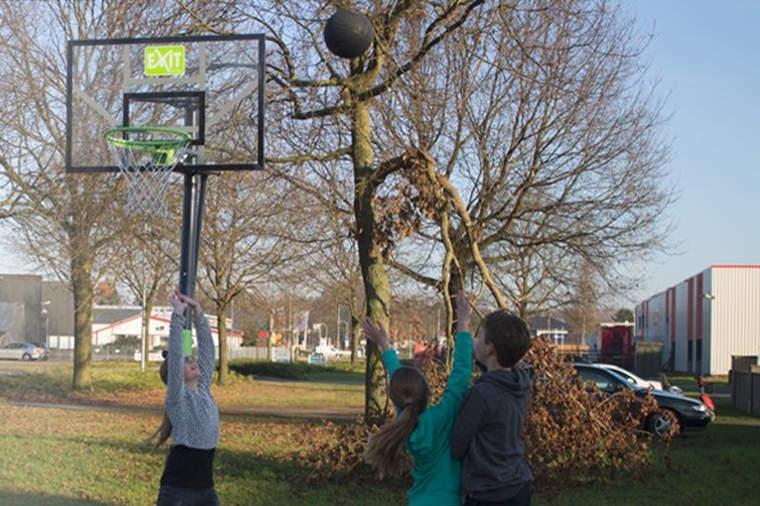 The EXIT Galaxy portable basketball backboard on wheels is green and black in colour and can be adjusted to five different heights (230 – 245 – 260 – 285 – 305 cm). This basketball system will guarantee hours of basketball fun for any child. It is equipped with a unique frame on wheels, making it ideal for any location. The frame is a unique system on three wheels and a counterweight which allows you to easily move it without tilting the frame. The swivelling castor at the front side lets you steer the backboard in whatever direction you want. It is robust and made from high-quality materials ensuring a long lifespan. Manual is included. The EXIT Polestar portable basketball board with dunk hoop comes on wheels and is very durable. This basketball system has a unique frame on wheels with a counterweight so that you can easily move the frame and move the whole system to any location. The backboard can be adjusted to five different positions (230, 245, 260, 285, 305 cm) and comes with a basketball dunk ring and a net. It is ideal for the best slam-dunks, passes and assists. It is green/black in colour and comes with a manual. 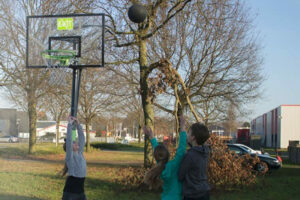 The EXIT Comet portable basketball backboard is green and black in colour and is user-friendly. This basketball system is great in any garden or driveway. It is equipped with a frame on wheels making it easy to move around to suit any location in your home. The frame has two sturdy wheels and a counterweight allowing you to easily move the basketball backboard by tilting the frame slightly. It can be adjusted to six different heights (230, 245, 260, 275, 290, 305 cm). Manual is included. If you have additional questions about our EXIT basketball systems then let us know and we will be pleased to provide you with personal advice and answers to any questions. Contact us today by calling us on 021-496-5132 or by visiting us online. EXIT soccer goals are great for children to practice and enjoy the sport. They come in many different types and sizes, are suitable for gardens and football fields from small ones to big ones. From strong and light to solid and strong to foldable goals, we have a soccer goal for all types of users needs. Here is our full range of EXIT soccer goals. The EXIT Scala aluminium football goal 500x200cm is an ultra strong, lightweight football goal that can be easily moved from place to place. It is the biggest goal in the EXIT Scala-family. The front of the frame is anodised meaning that the frame gets an additional protective top coating for a longer lifespan and a beautiful look. The rear side of the frame is powder-coated for a perfect finish. It has a sturdy net that is black and easy to attach using black plastic hooks that are mounted in the profile. The EXIT Panna steel football goal 150x60cm come as a set of 2 are sturdy, practical and are beautifully designed. With these football goals, you make every location suitable for a football game. They are easy to store and are set up in no time. Its sturdy black frame of the football goal is galvanised and powder-coated for a long lifespan and the fine-meshed net is attached to it in an innovative way. 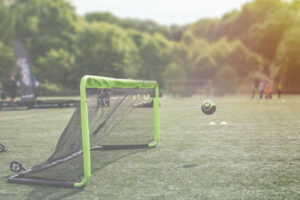 Included are 2 black steel football goals (150x60cm), fine-meshed net and a manual to put it together. The EXIT Flexx pop-up football goal 120x80cm is flexible, handy to take along with you and easy to set up. You can have a game of football at any time and at any location with this fantastic goal. It comes in a handy storage bag that you can take anywhere. It is black in colour. The goal is set up as soon as you take it out of the bag. Anchoring pins are included to ensure that the pop-up goal remains firmly standing and do not fall over during a game. The EXIT Flexx pop-up football goal 120x80cm (set of 2) are flexible, handy to take along with you and easy to set up. You can have a game of football at any time and at any location. They come as a set of two goals, come in a handy storage bag that you can take anywhere. The goals are set up and ready to use as soon as you take them out of the carry bag which is included. Anchoring pins are included ensuring that the pop-up goals remain firmly standing and do not fall over during a game. They are black in colour. The EXIT Pico steel football goals are strong, practical and also beautifully designed. They come as a set of 2 and are foldable making them easy to store and set up. With these two football goals, you make every location suitable for a football game. They have a sturdy black frame which is galvanised and powder-coated for a long lifespan. Included is a fine-meshed net and manual to help set them up and use. The EXIT Panna steel football goal 150x60cm is a sturdy, practical and beautifully designed football goal. This goal is compact, light and practical and comes in a sleek black design. With this football goal, every location is suitable for a football game. It is easy to store and can be set up in no time. The sturdy black frame of the football goal is galvanised and powder-coated for a long lifespan and the fine-meshed net is attached to it in an innovative way. It comes with a manual to help you set it up. The EXIT Maestro steel football goal 180x120cm is a sturdy, practical and are beautifully designed football goal. Training your football skills with this high-quality, sleek black design football goal has never been so fun and is the ultimate practising piece of equipment. It comes standard with an anchoring set that consists of ground anchors and anchor tubes. This lets you remove the football goal very easily while mowing the lawn and when you want to play again, the goal is re-positioned in the right place very easily. Its solid black frame of the football goal is galvanised and powder-coated for a long lifespan and the fine-meshed net is attached to it in an innovative way, preventing the ball from shooting between the frame and the net. Some of the features included are a manual, training screen and a handy training wall. The EXIT Coppa steel football goal 220x170cm is a large football goal and is black in colour. This goal is sturdy, practical and beautifully designed. See how good your shot is by using the training screen included in the set, which you can easily hang onto the frame. It comes standard with an anchoring set that consists of ground anchors and anchor tubes. This lets you remove the football goal very easily while mowing the lawn and when you want to play again, the goal is re-positioned in the right place in a trice. Included is a manual for set up and a training wall. The EXIT Forza steel football goal 500x200cm is the largest EXIT football goal. The goal is a full 5-metres in width. This goal guarantees hours of football fun and lots of goal scoring. It comes standard with an anchoring set that consists of ground anchors and anchor tubes. This ensures that the goal stands securely during a football game, but it can be easily removed while mowing the lawn and re-positioned in the right place in no time when you want to play again. The sturdy black frame is galvanised and powder-coated for a long lifespan and the fine-meshed net is attached to it in an innovative way. The manual included tells you how to set it up and other relevant information. The EXIT Scala aluminium football goal 220x120cm is very strong, yet lightweight. This football goal can easily be moved from place to place depending on where you want to play football. 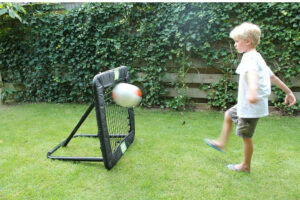 This football goal fits in any garden due to its compact size. The front side of the frame of this football goal is anodised meaning that the frame has an extra protective top coating for a long lifespan and a beautiful look. The rear side of the frame is powder-coated for a perfect finish of the football goal. The net of the EXIT Scala goal is black, sturdy and easy to attach using the black plastic hooks that are mounted in the frame. Manual is included. If you would like to learn more about or Exit soccer goals then call us on 021-496-5132 or visit us online today. For many children nowadays playing sport in the park isn’t as interesting as sitting in front of a screen all day playing their favourite video game. If this trend continues we are encouraging obesity and introverted children. Kids are bombarded with different technological advancements at a younger age than ever before. While the use of an electronic device isn’t all that bad for children it may encourage children to stay indoors and forget about playing outside which can bring about its own set of problems and concerns. Sports has unparalleled popularity and foundations of positive values. There are a lot of different benefits of kids using sports toys & equipment. Develops positive character traits, moral principles and quality values. Helps children feel good about themselves both physically and mentally. Sports is a good way to boost up a child’s self-esteem and improve their self-confidence. Participating in sports reduces stress as well as limiting conflict and aggressive outbursts. Children develop physical skills, exercise regularly and have fun through the use of sports equipment and playing a sport. Physical education has a great role to play in the personality development of children through sports activities and the use of sports toys. Skills that are picked up during the participation in sport have a big impact on the holistic growth of kids. They will learn about the important values of teamwork, fair play and respect. Playing sport helps kids to learn how to cope with competition as well as to respect authority, rules, team colleagues and opponents. Positive impact on children’s ability to learn and their educational growth. Studies have shown children who play sports perform better at school. When you exercise the body you exercise the brain also providing better cognitive function. Being active helps children burn calories and use up their energy, which allows them to stay fit, avoid obesity and get rid of toxins from their body. Participating in sports results in increased cardiovascular fitness, a healthy growth in their tendons, bones, ligaments and muscles. Playing sports enables them to create friendships they otherwise might not have formed. For example, the friendships athletes create remain intact even when they are not playing sports and can often last a lifetime. Joining a local sports team or participating in school sports, is great for a child to make new friends. New activities will also open up chances for an entirely new circle of friends for the kids. Competitions are seen as opportunities to learn from their success and failure. Losing often motivates kids to work even harder to achieve success which is relatable to all facets of life. Better balance, coordination and improved quality of sleep through physical activity. Sports toys give children a fun opportunity to go outdoors, exercise and breathe in some fresh air. Nowadays most kids are happy with staying indoors, playing with technology, playing computer games and watching television resulting in no exposure to communication in the outside world or access to quality fresh air. Teaches children about working in a team, goal building and achieving success which is relatable and applicable to other aspects of life in the future like school and work life. There is no doubt that providing an avenue of sports for children has unprecedented benefits. If you would like to see our full range of sports toys and equipment call us on 021-496-5132 or visit us online today.